My husband and I actually sat down for a meeting before the Great Homeschool Convention and came to the conclusion that virtue and character needs to be at the forefront of our homeschool this year. Most importantly we want to point our children to God’s Word for there is nothing better than the Bible to teach us about honesty, obedience, diligence, and all the other virtues. 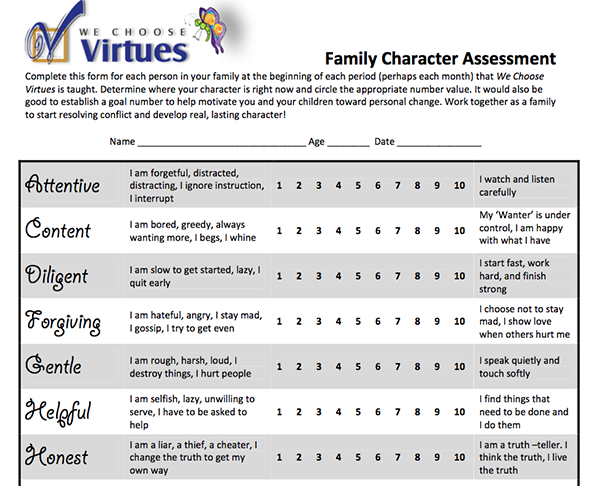 One resource we have found to help us with our lofty goal is We Choose Virtues. We were sent the Parenting Cards – NIrV version ($38.49) and a Download Bundle ($7.99) to review. These items are for ages 3 to 11. The Parenting Cards are attractive bright cards. As soon as they arrived and I had pulled them out of the envelope, Bear and J-jo were all over them, reading through all the virtues: I am content, self-controlled, perseverant, patient, obedient, kind, honest, helpful, gentle, forgiving, diligent, and attentive. 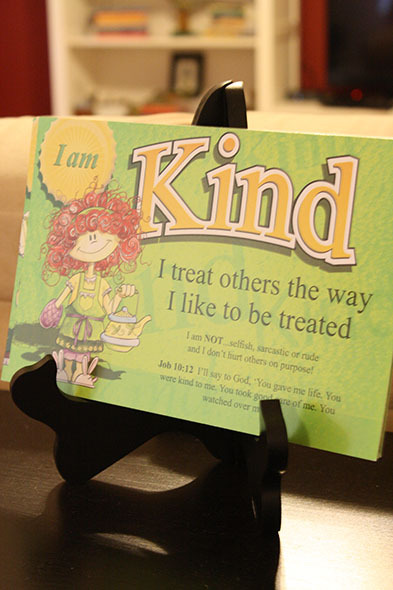 The front of the cards also showcases the catchphrase, a non example, and a Bible verse that emphasizes the virtue. Our cards had the NIrV Bible verses. The cards are also available with Bible verses in KJV, but the KJV cards only have old testament verses. It’s really important to have non-examples (or antonyms, as We Choose Virtues calls them in the Teacher’s Handbook). When I took my teacher training years ago, I distinctly remember our social studies professor telling us that abstract ideas need to be defined with both examples and non-examples and that is just what We Choose Virtues has done. The cards not only define the virtue (I am Gentle. I speak quietly and touch softly. ), but they provide antonyms or non-examples (I am NOT…rough, harsh, or loud, and I don’t destroy things or hurt people!). We have been committing the Bible verses to memory, as well. 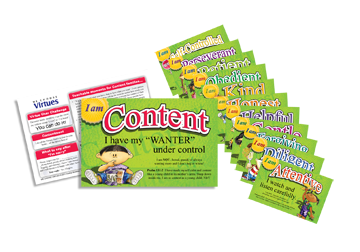 The backs of the Parenting Cards have the teaching component. The “teachable moments” include a discussion point or two and a short activity. Also, there is a challenge for the family, a call to find the virtue in your favorite books, and a part that teaches how to apologize properly. The kids’ favorite part is the Kids of VirtueVille section which tells a short story about the character for the virtue. For example, the I am Gentle card has Gerbil and Jill (all the characters have alliterative or rhyming names to help you remember them. Jill helps out in a pet store and has a cute little gerbil. She used to play rough with the puppies, but now she has to be gentle because the gerbil sleeps in her shirt pocket. 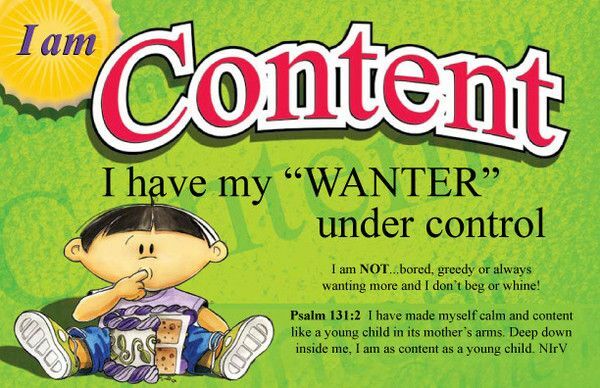 You can see the I am Content card below for another example. My kids love to color so the coloring sheets were fun for them. Our very favorite resource from the Download Bundle was the Sing-along-along sheets. These are black line masters that can act as coloring sheets as well. I put ours in our Morning Time binder and pulled it out at morning time every day to review the virtues we were focusing on. The tunes are ones most people are familiar with like “I’ve been working on the Railroad,” “Itsy Bitsy Spider,” and “She’ll Be Comin’ Round the Mountain,” but the words are the words on the virtue cards. We focused on the cards for Gentle (I have a bit of an explosive boy), Perseverant, Self-Controlled, and Kind. At the beginning of the week, I showed them the front of one card. We read the definition and non example and the Bible verse. We repeated the Bible verse a few times to get it in our head. We did the Teachable Moments on the back and of course I read the story for the character. We sang the song. Then the rest of the week, we would review the front of the card and sing our go-along song. As we added cards to the stack, I would keep the first day as an introduction of the new card, but during the rest of the week, we would review the other cards and sing the songs for all the cards we had done thus far. I kept the cards on a frame stand that I use for various things (one of which is to hold up our iPad). You can find these stands at Walmart. On our Family Character Assessments, we came to the conclusion that we are rather good at being helpful, attentive, and patient. It is nice to be able to assess on virtues and see the improvements made over time as we try to be diligent about changing. The Teacher’s Handbook that comes with the Download Bundle is useful. Though certainly geared more for a classroom teacher, there are plenty of nuggets in there for parents. 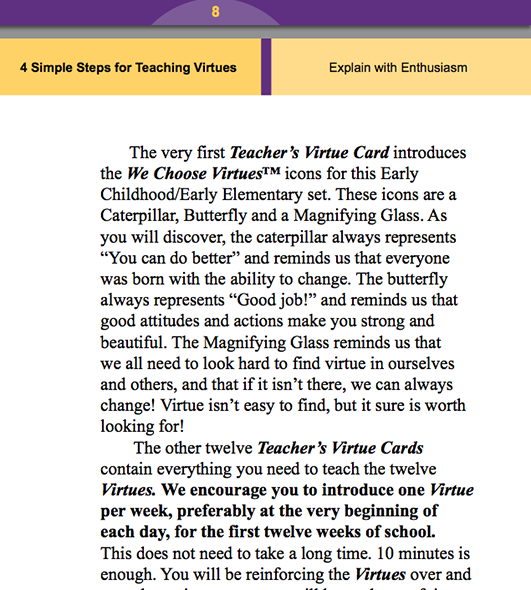 It explains in depth the four simple steps to teaching virtues, giving details and examples. I think you could use the Parenting Cards just fine without the Teacher’s Handbook, but it is handy to read through it and I was better able to understand the whole program by reading the Teacher’s Handbook. While I like We Choose Virtues and am thankful for the Parenting Cards, I think they are a bit expensive and I would never taken the initiative to spend that much money on them. While my children are certainly enjoying the cards and are able to parrot the catchphrases and the songs, I am not seeing that much improvement in their application of what they have learned. Perhaps it just needs more time for it to become second nature. One thing that has been neat is to see how starting to sing one of the songs will help my daughter refocus her energies back to the correct path. Unfortunately, they have an opposite effect on my son and just make his behavior worse. If you have an unlimited budget, I do recommend them, especially if you have preschoolers and young elementary aged kids, as these Parenting Cards would form a great base of understanding for the virtues. I have tried to teach virtues by pulling free things off the internet, and it was a lot of work. I love that the Parenting Cards have done all the work for me and that they have even included a fun factor for the kids, something I would not have added in myself. Of course, the most important thing in teaching virtues is to make sure you are modeling them yourself. The other thing is that We Choose Virtues is a very quick thing to add to your day. My DIY plans from a couple of years ago were a little too involved. 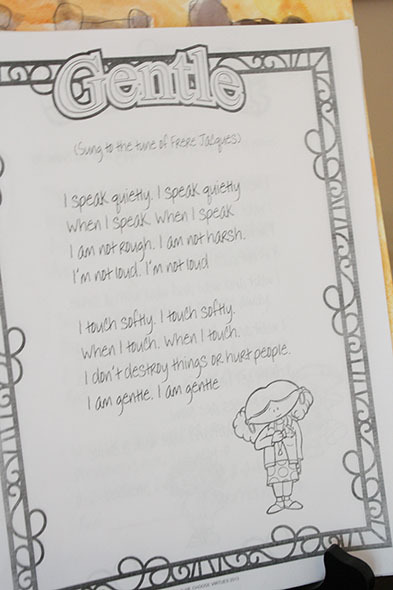 We Choose Virtues just adds 10 minutes to our Morning Time list and I can review it as I need to address behavior during the day. The catchphrases make disciplining a little easier by giving me words to say that are neutral – they aren’t from Mom, but from a curriculum, so my kids seem to respond to it better. The caterpillar to butterfly metaphor used by the curriculum has been very effective for my son to understand that he does indeed have the power to change how he is and that he has the choice to remain an (ugly) caterpillar or put in the effort and become a (beautiful) butterfly. I just wish it could be an instantaneous change! We Choose Virtues has been a benefit to our family and I recommend their company with the caveat that it will only be as successful as your kids are willing, and mine are just especially stubborn and resistant, though they do act wonderfully a large portion of the time. The Parenting Cards are not a magic bandaid you can apply and have all the negative behavior disappear from your household.